Many pond owners think that aeration is only useful in the hot summer months to protect fish but the fact is, a pond aerator is the perfect tool for winter time too. When ice build up threatens your floating dock or boat lift, or your fish are a concern, then an aerator can be of great help. During periods of prolonged ice build up on a pond, it's often a great idea to create a spot of open water that remains free of ice. This allows trapped gasses to escape from the pond, and it helps desired oxygen to enter the water. Winter and early spring fish kills can be minimized through consistent aeration. In many ponds, a traditional aeration system will work very well. This includes a land based pump or compressor, weighted airline, and a diffuser which sits at the bottom of the pond. This allows diffused air to be released at a particular point, or multiple locations at the bottom of the pond. 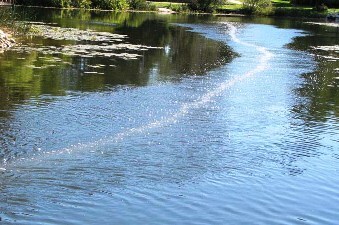 When using a typical pond aerator like this during the spring, summer, and fall, we suggest locating the diffuser at the deepest part of the pond, and in effect you'll be aerating the entire body of water. This increases dissolved oxygen levels throughout the pond and helps to protect fish, and maximize aerobic bacteria activity, which help to keep the pond cleaner and more balanced. During cold conditions, oxygenation is not as critical since cool and cold water retain dissolved oxygen much better than warm water does. However gases like methane can get trapped under the ice, and this will cause problems for fish if concentrations build up too much. So by keeping a spot open from ice, these dangerous gases can escape and more oxygen can come in from the surface. We achieve this by placing a diffuser in a shallower position, or at least away from the deepest part of the pond, and by doing this, we concentrate our air release in one spot, and avoid aeration from the deepest section of the pond. This allows fish to go to the bottom where the water may be warmer and calm (water is colder near the surface in the winter). 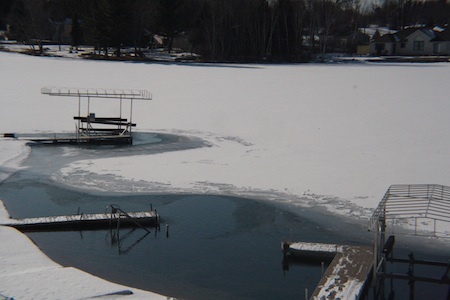 In the photograph at the top of the page, you can see that protecting a dock from ice damage requires a different approach than using a traditional aerator. In this particular setting we still use a land based pump, which is usually a rotary vane compressor, weighted airline, and instead of a plate type diffuser we use diffuser bubble tubing, which can run in lengths up to 100' long (using 2x50' sections). This is perfect for creating a zone or area of open water instead of just a spot and provides the best possible protection from ice build up. Bubble tubing also works very well in canals or long and narrow ponds that are fairly shallow in depth. Normal depths range from about 2' and up to 7'. We normally suggest using a "T"connector which connects the incoming weighted airline to the diffuser tubing. Equal lengths of the diffuser tubing can then be attached to run off each end of the "T". This allows for the best distribution of air throughout the pond. We've created several diffuser tubing kits below which are designed for optimum protection of your boat dock. Simply estimate the area of coverage you may need and select the proper length of tubing to fit your requirements. All kits include the appropriately sized compressor, 100' of weighted 5/8" airline, "T" connector, and standard lengths of diffuser tubing of 50' and 100' lengths, or order by the foot for converting your existing aerator over to this unique type of diffuser. We including everything you'll need in our kits to get up and running easily.